Three of the rarest species of plants in Denmark can be found on a limestone slope in a side valley to the Lindenborg river valley in Himmerland. Orchis ustulata (right picture) has now only 2 sites i Denmark both in Northern Jutland. On the site in Himmerland the plant is threathened to be overgrown by higher vegetation because this small species is totally dependant of grazing of its habitat. Another threat is the great number of visitors that come to take pictures of the rare orchid. The eager photographers forget to look where they walk and many small individuals of Orchis ustulata are trampled down. The area is now protected and under restoration, and the number of plants has slowly been rising in the recent years. Also Crepis praemorsa (left picture) can be found on the limestone slope. This species has only a few sites back in Denmark. Other rare species on the slope are Cineraria integrifolia which is only found in Northern Jutland and the grass Koeleria pyramidata. A number of species typical for calcerous grassland is also present as Arabis hirsuta, Campanula persicifolia, Helianthemum nummularium and Pulsatilla vulgaris - a species allmost only seen in Jutland. 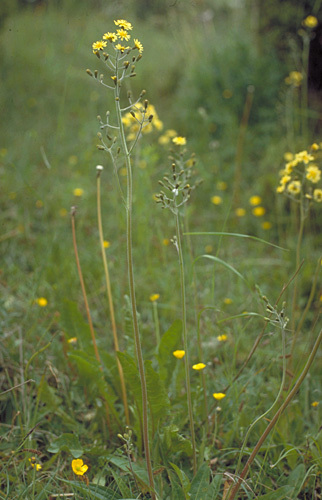 Of other more common lime-loving species there is Plantago media, Cirsium acaule, Briza media, Galium boreale, Avenula pratensis and Hieracium lactucella. Due to the low nitrogen level in the soil a number of species usually seen on poor, sandy soils are present as Scorzonera humilis, Hieracium pilosella, Thymus serpyllum and Juniperus communis. 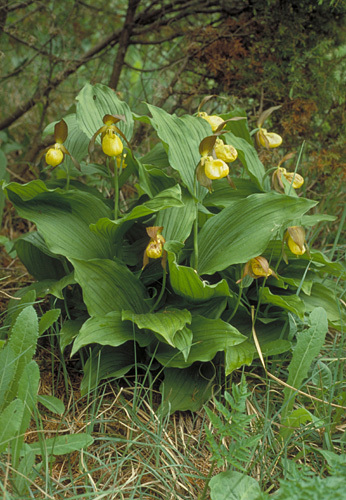 The third botanical rarity on the site is Cypripedium calceolus. C. calceolus has long been known from the Rold Skov (Forest of Rold) also in Himmerland as the only site in Denmark. 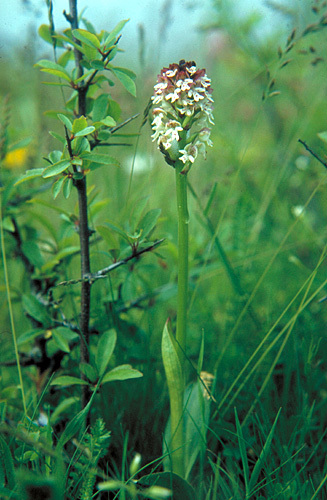 Here the population is surrounded by a number of high fences to avoid digging up of this rare orchid. There is now established a parking-place and signs are leading to the fences. In recent years the population is declining propably due to overgrowth of the plants and poor pollination. To a great surprise a new established population of C. calceolus was discovered in the 1980'ies on the limestone slope. Here the pollination is very good and the population is spreading. The only problem is trampling of the young plants by the many visitors. For many years ago C. calceolus most likely has grown on Mon but today the species is only known from two sites in Denmark. Back to The Limestone in Himmerland.